Why kids from Dubá Primary school bake cakes from old bread? What do people often throw away? What do they waste? What could we find in their bins? And mainly – why? These and other crucial questions were discussed by kids from the Czech Primary school in Dubá. Then, they went to the streets of Dubá, asked around, collected their old bread, and after that came back to school to bake a delicious cake. 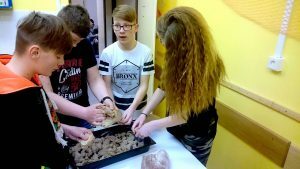 The kids and teachers from Dubá took part in a one-day project called „Stop wasting food!“ First, they discussed this issue together, wondering why people throw away and waste so much food, and after, they tried to find out what could be done to improve this situation. The kids also talked about their own experience at home. – The most wasted type of food is bread, followed by vegetables and fruit. – People in the US waste the most food, each US citizen throws away up to 400 kilos of food a year on average. – Every person in the Czech Republic wastes 70 kilogrammes of food each year on average. Let´s go to streets and talk to people! So, people in the Czech Republic and the rest of Europe throw away and waste much less food than in the the United States. However, the numbers and statistics show us that we should try to improve and reverse this situation. Almost every day, we hear or read about hunger in the world, and how millions of people are dying because of starvation, and after that we throw away our leftovers, bread, vegetables, fruit, etc. The kids from Dubá understood this serious problem, and so, they decided to go to the streets and talk to people. The pupils prepared a questionnaire and divided themselves into groups. Every group went to a different part of Dubá, and talked to its residents, at home, at restaurants, or in the streets. They informed them about the important things they found out in their research on food waste, and then they asked them the questions they prepared. 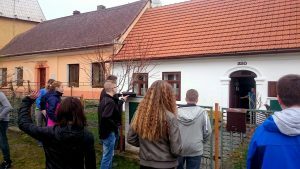 They found out that, for example, the elderly people in Dubá try to collect leftovers to feed their animals, and by doing so they do not waste as much food. Old bread – useless or delicious? The kids decided to focus on the most wasted food, bread. They wanted to know how much bread the people in Dubá normally waste and they were really determined to collect the old bread and reuse it. The kids really enjoyed the whole activity. They appreciated the teamwork and communication with people. They mainly understood that food waste is an important issue which should be discussed and tackled. So, if you have some old bread, don’t hesitate to try their recipe! Mix it all together and bake for 40 min at 180°C.